The Animal Farm allegory chart below helps to understand the characters, places and key events in this political allegory. Almost every detail has significance in this allegory, and we have decoded its symbolical characters and events in the chart below. Mr. Jones – represents the last Tzar of Russia, Nicholas II. Mrs. Jones – symbolizes the Tzar’s wife, Alexandra. Mr. Pilkington – composite of the leaders of England. Mr. Frederick – composite of the leaders of Germany. Mr. Whymper – capitalist who did business with the Soviet state. Squealer – the Russian media. Minimus – the takeover of art by propaganda. Old Major – represents Karl Marx, also symbolizes Vladimir Lenin. Boxer – the working class. Clover – Boxer’s female counterpart. Mollie – Russia’s upper classes; this symbolism may represent members of the working class that remained faithful to the Czar. Jessie, Bluebell, Pincher – dogs mentioned by name. Raven Moses – the Russian Orthodox Church. Three young Black Minorca pullets – The leaders of ‘resistance’. Cockerels – an alarm clock for Boxer. Pigeons – the “Communist World Revolution”, Comintern. Ducks – some type of peasantry. Old Benjamin, the donkey – the aged population of Russia. Muriel, the white goat – the minority of working class who are educated. The Cat – ‘shady’ members of Russian society. Rats & Rabbits – seem to represent beggars, thieves and gypsies. Cows – milkmaids or prostitutes. Fox – a metaphor for revolutionaries. Sheep – the masses at large. Animal Farm – The Soviet Union (U.S.S.R.). Manor Farm – Russia. Willingdon – a metaphor for Europe. The Farmhouse – The Kremlin. The Red Lion – the Royal Palace in England, or one of the smaller nations in Europe. Sugar Candy Mountain – reference to ‘Heaven’. Hoof & Horn – Hammer and Sickle. Animal Committees – Soviet Committees. ‘Beasts of England’ – the ideology of Communism. Windmill – a symbol for Stalin’s ‘Five-Year plan’. Drinking of alcohol – a metaphor for the intoxicating effects of power. ‘Milk’ – commodity that the pigs have decided to keep it for themselves. ‘Apples’ – another commodity that the pigs decided to keep as well. The Animal Revolt – The Russian Revolution. Battle of Cowshed – Red October. The Meeting – The Soviet, The Pre-Bolshevik Provisional Government. The hens’ revolt – the Ukrainian peasants’ resistance to collective farming. Destruction of the Windmill – failure of the Five Year Plan. Selling of the wood to Frederick – Nazi-Soviet pact. Battle of the Windmill – Battle of Stalingrad. Click this link to download the Animal Farm allegory chart PDF. The book Animal Farm is an allegory because it conveys a meaning other than literal and represents these hidden and abstract meanings through material forms. An allegory is when the characters or events represent particular ideas that relate to morals, politics, religion etc. In Animal farm, almost everything represents something else. 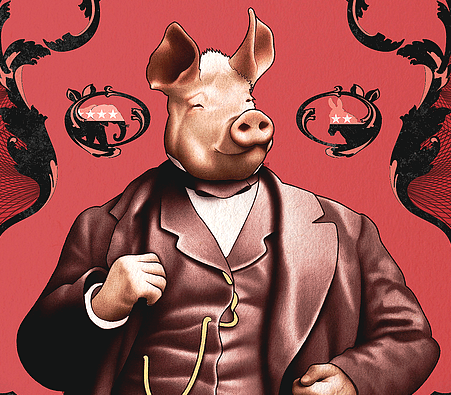 As the Animal Farm allegory chart shows, allegorical examples in this books include: the mankind representing the capitalists and the royalty, pigs representing capitalists, dogs – army, and Sugar Candy Mountain representing heaven. The main action represents the Russian Revolution of 1917 and the early years of the Soviet Union. Animalism is communism. Manor Farm is allegorically Russia, and the farmer Jones is the Russian Czar. This 1945 novella by George Orwell is an allegorical commentary on how the Czarist Russia changed into Communist Russia. George Orwell is most famous for this political allegorical novella. The technique of the allegorical satire in Animal Farm is similar to the Swift’s book Gulliver’s Travels.